Soriano is one of only 55 major league players to hit 400 or more career home runs, and was seventh among active players in home runs at the time of his retirement. Soriano disliked the intense Japanese practice schedule, and the Carp denied him a salary increase from $45,000 to $180,000 per year. Like Hideo Nomo and Hideki Irabu, who had previously left Japan to play in the United States, Soriano hired Don Nomura to help his situation. After first attempting to void Soriano's Nippon Professional Baseball (NPB) contract by unsuccessfully arguing that the player was legally a minor when he signed it, Nomura advised him, like Nomo, to retire from NPB and pursue a career in MLB. This prompted Carp executives to file an injunction against Soriano, and to send letters to MLB teams demanding that they cease all negotiations with him. After the Nomo case, NPB officials had amended the Working Agreement without consulting any MLB officials in an attempt to prevent the situation from recurring. Since MLB had not agreed to any changes to the agreement, MLB Commissioner Bud Selig declared that MLB would recognize Soriano as a free agent on July 13, 1998 and the Carp backed down. In 2002, Soriano became the second Yankee in franchise history to record 30 home runs and 30 stolen bases in the same season (the first being Bobby Bonds in 1975), then repeated the feat in 2003. Also in 2002, he led the American League with 696 at bats, 209 hits, 92 extra base hits, 41 stolen bases, 128 runs and set a Yankees' team record for most at bats (696) and most strikeouts (157) in a season. He is one of only six players active as of 2009 who finished a 30-homer season with more homers than walks (39 HR, 23 BB), the others being Ryan Braun (34–29 in 2007), Garret Anderson (35–24 in 2000), Iván Rodríguez (35–24 in 1999), Joe Crede (30–28 in 2006), and José Guillén (31–24 in 2003). In 2002 he led the major leagues in power-speed number (40.0). 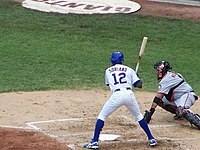 In 2003, Soriano set the record for most home runs to lead off a game in a season with 13, and for the second straight year, led the league in at bats, and finished in the top five for base hits, doubles, home runs, stolen bases, and strikeouts. In 2003 he again led the major leagues in power-speed number (36.4). In 2005, he finished sixth in the AL for stolen bases, and third for extra base hits (as well as eighth in strikeouts). He led the major leagues in power-speed number (32.7). On March 20, 2006, Nationals manager Frank Robinson inserted Soriano in the lineup as the left fielder. 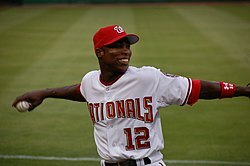 Soriano, who since 2001 had played exclusively at second base, refused to take the field, and the Nationals organization threatened him with disqualification, which would have meant forfeiture of his salary, and he would not have received credit for service time in fulfillment of the obligations of his contract. With his contract's service terms officially still unfulfilled, he would then have been ineligible for free agency at season's end. Two days later, Soriano relented and played in left field for the Nationals in their exhibition game against the St. Louis Cardinals. Robinson indicated that he considered Soriano's move to left field to be permanent and would not consider moving Soriano back to second base at any point during the season. In his comments following that game, Soriano indicated that he would accept his new position without further argument. As the season got underway, however, Soriano began to enjoy his new position, and by the All-Star break, he led the league in outfield assists and became one of the few players ever to start the All-Star game at two different positions. Soriano, making his fifth consecutive All-Star team, became only the third man to start All-Star games for both leagues at two different positions. On August 25, a week after reaching 30–30, he became the fastest man in baseball history to reach 200 home runs and 200 stolen bases, reaching the mark in 929 games (breaking the previous record of 1,053 games held by Eric Davis). On September 16, Soriano stole second base in the first inning to become the fourth player to join the 40–40 club, after José Canseco, Barry Bonds, and Alex Rodriguez. Many considered Soriano's 40-40 season to be the only one 'clean', as Canseco, Bonds and Rodriguez were all involved in the steroid controversy, he was also the only one of the four reaching the feat in playing at home. Six days later he became the first player to reach 40 home runs, 40 stolen bases and 40 doubles in one season. Soriano set a new career high in walks with 67 (previously 38). He also reached a career high in home runs with 46 (previously 39). He also had 41 stolen bases. He led the major leagues in power-speed number (43.36), with what through 2018 was the second-highest single season career mark ever. The Nationals considered trading Soriano before the deadline on July 31, because he was in the last year of his contract, which would grant him free agency at the end of the season. If the Nationals lost Soriano at the end of the season, they would receive a first or second round draft pick from the team that signed him and a "sandwich" pick between the first and second rounds as compensation. Soriano did not want to engage in contract negotiations during the season. However, Soriano expressed his strong desire to stay with the team. Both fans and players began to be more vocal in their support to keep Soriano. Manager Frank Robinson praised Soriano's leadership in the clubhouse, and further suggested that Soriano should be considered for MVP of the National League. There were plenty of suitors, including sending Soriano back to the Yankees, and the Chicago Cubs and Los Angeles Dodgers were also interested. However, Nationals general manager Jim Bowden felt that what he was offered was not worth trading him. The Nationals hoped to sign him to a long term deal before the season ended but on October 12, 2006 he rejected a $70M deal. The Chicago Cubs signed Soriano to an eight-year contract worth nearly $136 million. The contract marked the most expensive deal in the Cubs' franchise history at the time and went through 2014. It contained a no-trade clause, meaning Soriano could not be traded without his consent. The Cubs' manager, Lou Piniella, assigned Soriano to play center field, but later moved him to left field after he sustained a hamstring injury. He struggled during the first month of the season, during which he posted a .270 batting average, with no home runs. He managed to hit his first home run during the Cubs' first game in May, and gradually increased his batting average throughout the month. 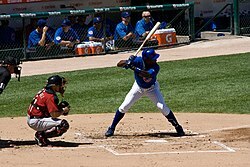 During the first few weeks of the 2008 season with the Cubs, Soriano struggled. He was only hitting .190 at the time he was put on the DL with a strained calf. After being activated, Soriano got off to a quick start, raising his average to .280 and increasing his home run total. In a one-week stretch in May, he hit 7 home runs in just 6 games, hitting nearly .500 during that stretch. At the end of May he had 12 home runs and 33 RBIs. However, his defense was extremely poor, and after being placed on the DL early in the season, Soriano was encouraged to stop hopping as he caught fly balls. This seemed to affect his play in the field as he misjudged two balls in St. Louis on May 2, shortly after being activated. After being severely booed by Cub fans who had traveled to St. Louis in that particular game, he homered in the ninth to send the game to extra innings. Later that month, he lost a ball in the sun and dropped what would have been the game's final out in the 9th inning against the Pittsburgh Pirates, allowing Jason Bay to reach safely and eventually costing the Cubs a win. As poor as Alfonso's defense was perceived to be, his arm had been just as much an asset to the Cubs, and he was one of the league's leaders in outfield assists. Soriano also led the team in home runs, despite having played in only 109 games. 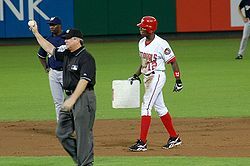 On August 22, Soriano accomplished one of baseball's rarest feats, as he stole home plate in a loss to his old team, the Washington Nationals. In voting for the 2009 All-Star Game, Soriano was fourth among NL outfielders (2,692,994 votes), trailing Ryan Braun (4,138,559), Raúl Ibañez (4,053,355), and Carlos Beltrán (2,812,295). On July 26, 2013, the Cubs traded Soriano to the New York Yankees, who paid him $5 million prorated for 2013 and $5 million of the $18 million owed to him in 2014. The Cubs received pitcher Corey Black from the Single-A Tampa Yankees. On August 11, 2013, Soriano recorded his 2,000th career hit, a home run off of Detroit Tigers pitcher Justin Verlander. On August 13, 2013, Soriano hit two home runs and had a career-high six RBIs. The next day, he broke his career high set the previous day by driving in seven runs. He became one of only three players in the live-ball era to drive in at least six runs in back-to-back games (the other two being Rusty Greer in 1997 and Geoff Jenkins in 2001). He also became just one of seven players to record 13 RBI in a two-game span, and fell just two RBI short of the all-time record set by former Yankee Tony Lazzeri. Soriano's 412 career home runs put him in 53rd place on the all-time list at the time of his retirement. Soriano led all major league second basemen in errors every year from 2001 to 2005 (19 (tied), 23, 19, 23, and 21). In 2006, he was second in the major leagues of all left fielders in errors, with 11, but led all left fielders with 22 assists, 9 double plays, and a 2.29 range factor. Soriano's paternal family, the Guilleards, are of Haitian descent. His mother Doña Andrea Soriano, is the sister of Hilario Soriano, a former catcher of the Licey. Soriano and his wife Carmen Isis Eusebio have three daughters named Alisis, Angeline, and Alisha, and three sons named Allen, Angel, and Alfonso Jr.
^ Coskrey, Jason (November 8, 2014). "Fateful decision in Japan put Soriano on path to MLB". Japan Times. Retrieved 14 July 2015. ^ Nightengale, Bob (May 14, 2002). "Soriano makes difficult game seem easy". USA Today Baseball Weekly. Retrieved September 6, 2008. ^ a b Pearlman, Jeff (August 26, 2002). "He's Arrived". Sports Illustrated. Archived from the original on January 2, 2013. Retrieved November 21, 2008. ^ Whiting, Robert (April 2004). The Meaning of Ichiro: The New Wave from Japan and the Transformation of Our National Pastime. Warner Books. pp. 142–144. ISBN 0-446-53192-8. ^ "Yankee Farmhand helps beat U.S." Herald Journal. Associated Press. July 11, 1999. Retrieved November 7, 2014 – via Google News. ^ "Selig gives blessing to mega-merger". ESPN.com. February 17, 2004. Retrieved September 6, 2008. ^ Newman, Mark (July 14, 2004). "Soriano all smiles as All-Star MVP". MLB.com. Archived from the original on January 19, 2010. Retrieved September 6, 2008. ^ "Rangers trade Soriano to Nationals for three players". ESPN.com. December 8, 2005. Retrieved September 6, 2008. ^ Ladson, Bill (February 10, 2006). "Soriano loses arbitration case". MLB.com. Retrieved September 6, 2008. ^ "Elias Says ..." espn.go.com. August 26, 2006. Retrieved November 13, 2011. ^ Bill Ladson (January 1, 2011). "The Official Site of Major League Baseball: Major League Baseball News". Mlb.mlb.com. Retrieved November 13, 2011. ^ a b Muskat, Carrie, Cubs complete blockbuster with Soriano Archived 2007-11-02 at the Wayback Machine (November 20, 2007), MLB.com, Retrieved on August 6, 2007. ^ Muskat, Carrie, Piniella considering Soriano in center Archived 2007-11-02 at the Wayback Machine (January 20, 2007), MLB.com, Retrieved on August 6, 2007. ^ Odum, Charles, Chi Cubs 9, Atlanta 1 Archived June 11, 2007, at the Wayback Machine (June 8, 2007), Yahoo! Sports, Retrieved on August 6, 2007. ^ Gano, Rick, Chi Cubs 3, Chi White Sox 0 Archived July 12, 2007, at the Wayback Machine (June 24, 2007), Yahoo! Sports, Retrieved on August 6, 2007. ^ Muskat, Carrie, Soriano homers twice as Cubs win Archived 2007-09-03 at the Wayback Machine (July 28, 2007), MLB.com, Retrieved on August 6, 2007. ^ Wittenmyer, Gordon. Jones, Cubs rock on Archived 2007-11-13 at the Wayback Machine (August 11, 2007), Chicago Sun-Times. Retrieved on August 22, 2007. ^ a b Muskat, Carrie. Notes: Running encourages Soriano (August 21, 2007), MLB.com. Retrieved on August 22, 2007. ^ Wittenmyer, Gordon, Soriano return set for Tuesday[permanent dead link] (August 27, 2007), Chicago Sun-Times, Retrieved August 27, 2007. ^ Associated Press, Soriano's lead off homer sets major league record, ties Cubs mark for September Archived 2007-11-12 at the Wayback Machine (September 28, 2007), Sporting News. Retrieved on October 21, 2007. ^ Muskat, Carrie (May 3, 2008). "Cubs' comeback comes up short". MLB.com. Retrieved September 6, 2008. ^ Muskat, Carrie (May 25, 2008). "Cubs have Sun-day blues vs. Bucs". MLB.com. Retrieved September 6, 2008. ^ "Cubs lose Soriano to broken left hand in 7–2 win over Braves". USA Today. Associated Press. June 12, 2008. Retrieved September 6, 2008. ^ "Holliday to replace Soriano in NL All-Star lineup". ESPN.com. Associated Press. July 10, 2008. Archived from the original on 20 August 2008. Retrieved September 6, 2008. ^ Muskat, Carrie (August 22, 2008). "Cubs stunned by Nats' late rallies". MLB.com. Archived from the original on 6 September 2008. Retrieved September 6, 2008. ^ Sherman, Brad (July 5, 2009). "Victorino on All-Star 'Final Vote' ballot – Mauinews.com | News, Sports, Jobs, Visitor's Information". The Maui News. Retrieved November 13, 2011.